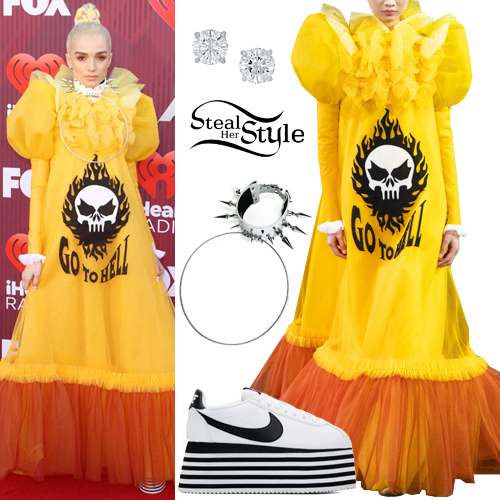 Poppy arrived at the iHeartRadio Music Awards in Los Angeles wearing Viktor & Rolf Spring 2019 Couture (Not available online), a custom-made Bitchfist Choker (Not available online), Tiffany & Co. Diamond Stud Earrings ($1,200.00 – wrong size) and Comme des Garçons Nike Cortez Platform Sneakers ($390.00). In the next shot she wore a Mesh Top ($1,070.00) and matching Mesh Skirt ($1,270.00) by Fannie Schiavoni, with Giuseppe Zanotti Betty Platform Sandals ($795.00). In another shot Kylie is seen wearing a Regular Jersey Satin-Detail Tuxedo Suit (Sold Out) and a Tuxedo Shirt ($322.80) all by Giorgio Armani, Maria Tash Ruby and Diamond Ouroboros Ring ($405.00) and Philipp Plein Decolette Hi-Heels with Crystal ($2,240.00). In the next shot she wore a Cowl Neck Silk Satin Dress ($1,850.00), a Gold-Tone Leather Belt (£390.00), a Medusa Medallion Gilded Choker ($1,225.00) and a Bit-Versace Double Medusa Ring ($295.00) all by Versace, with a Tiffany & Co. Link 18k Gold Bracelet ($6,500.00) and Giuseppe Zanotti Sandals Gzxcowan Sandals ($2,495.00). In this shot Kylie is seen wearing a Draped Bustier Evening Top ($1,590.00), V-Neck Pants ($1,090.00), Multirings Earrings ($495.00) and Stretch-Jersey Ankle Boots ($570.00). Landry Bender attended the Teen Vogue Young Hollywood Party held at LA Theatre wearing a Sandro Pleated Lace Mini Dress ($257.50), Baublebar Scarlett Pearl Hair Clip ($24.00 – set of two), Return To Tiffany Mini Double Heart Tag Pendant ($125.00) and Return To Tiffany Bead Bracelet ($150.00) by Tiffany & Co. and Jeffrey Campbell Vedet Bootie ($112.46).